When he returned to Antwerp after his sojourn in Italy, Anton van Dyck painted several Crucifixions for different churches in that city. Related to those altarpieces, he also executed others with a smaller format in which he only represented Christ on the Cross, without secondary figures. 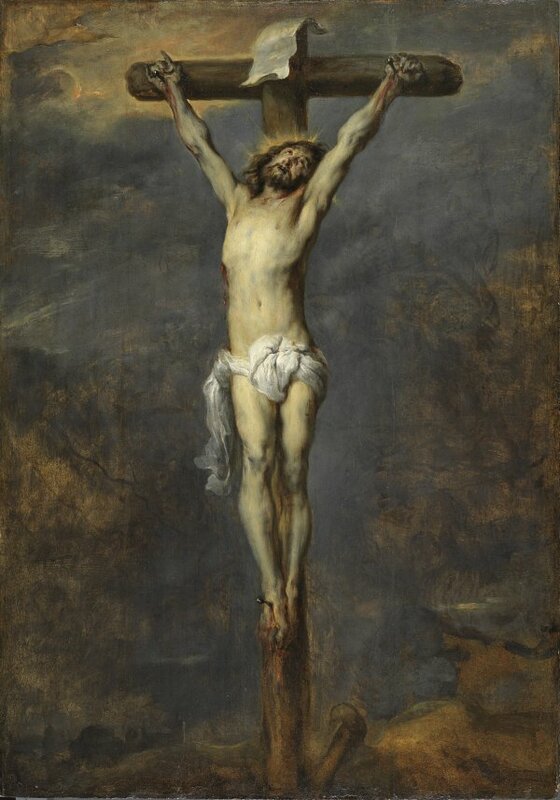 The paintings were probably intended for the private worship and show the Redeemer's loneliness during his agony, when he complained that His Father had abandoned him. Several versions of this composition are considered as workshop paintings or made by artists within his circle. The signed version taken as reference belongs to the Koninklijk Museum voor Schone Kunsten in Antwerp. We know that Van Dyck painted it in 1627 for the prior of the Augustinian convent in that city. The version shown here was first published in 1930 by G. Glück, who considered it autographical. In general terms, later bibliographies have followed his opinion. Larsen (1988), for example, mentions its sketchy style, "which confirms its authenticity". Yet the unknown author who comments on this painting in the corresponding catalogue entry of Sotheby's auction of 1995 described it as belonging to the "circle of Sir Anthony van Dyck", saying that "although the literature has never doubted its traditional attribution to Anthony van Dyck, many contemporary scholars do not accept it; some of them would rather attribute it to Jean Boeckhorst, and Michael Jaffé attributes it to this artist without doubt". Nevertheless, Jaffé's attribution to Boeckhorst has apparently not been published. Neither does it appear in any unpublished report, as stated in a letter of 25 June 2001 from Sotheby's to the Thyssen-Bornemisza Museum. When the painting was examined in the Thyssen-Bornemisza Museum's restoration workshop, in August 2001, traces of a previous composition, visible with the naked eye and legible if the panel is rotated ninety degrees, were discovered. They are fragments of a sketch, made with a brush, of a figure between two animals in a wood or surrounded by a clump of trees. The fact that the author of this Crucifixion used a panel in which another subject was already sketched, without completely covering the drawing of the previous composition, confirms what can be deduced from its highly strung and quick execution, namely that it was a modello or study to be kept in the workshop, a fact that would confirm the original-and not derivative-character of this work. The traditional attribution to Van Dyck should thus be maintained and, according to what has already been said, its date must be, almost certainly, the same as the Antwerp version, that is 1627.